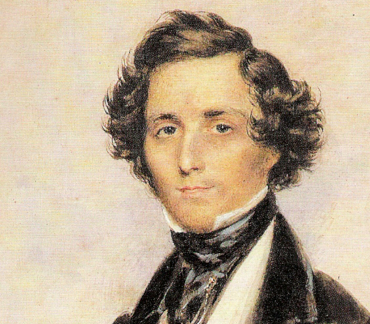 Mendelssohn’s essentially conservative musical tastes set him apart from many of his more adventurous musical contemporaries such as Franz Liszt, Richard Wagner and Hector Berlioz. The Leipzig Conservatoire (now the University of Music and Theatre Leipzig), which he founded, became a bastion of this anti-radical outlook. After a long period of relative denigration due to changing musical tastes and anti-Semitism in the late 19th and early 20th centuries, his creative originality has now been recognised and re-evaluated. He is now among the most popular composers of the Romantic era. deutscher Komponist, Pianist und Organist (1809-1847). 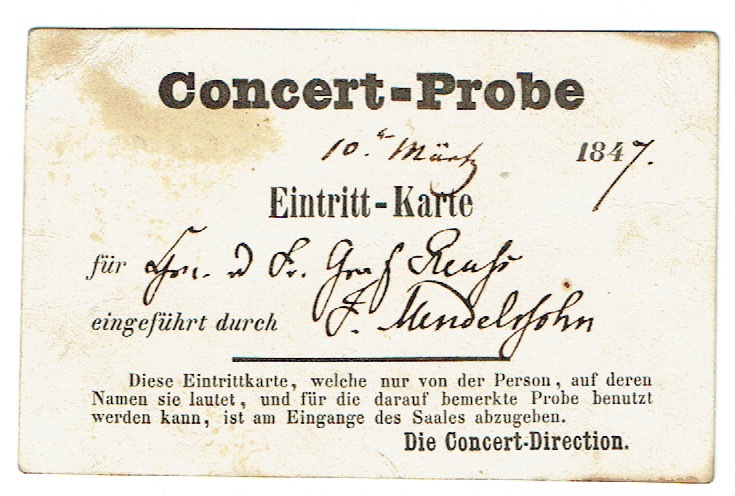 Rare partly-printed 3.25 x 2.25 admission pass issued by the Directorate of Gewandhaus concerts, filled out and signed by Mendelssohn-Bartholdy, Leipzig. Quer-12mo. Feinkarton. Leicht fleckig, ein Eckchen geknickt. 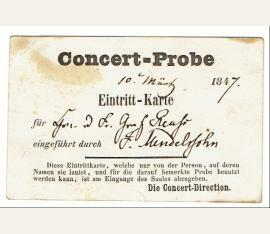 Rare partly-printed 3.25 x 2.25 admission pass issued by the Directorate of Gewandhaus concerts, filled out and signed by Mendelssohn-Bartholdy, March 10, 1847, made out for "Graf Reuss" and boldly signed in ink, "F. Mendelssohn." In fine condition. Komponist (1809-1847). Autograph letter signed. [London]. ¾ S. auf Doppelblatt. Kl.-8vo. Mit eh. Adresse (Faltbrief). To Mme. 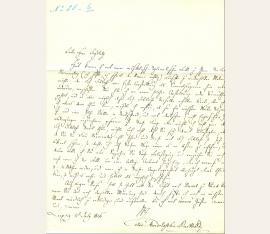 Moscheles, wife of the pianist Ignaz Moscheles, asking for a meeting, and telling that his old teacher had died. - Mendelssohn were in London that time for the first performance of his concert overture The Hebrides. - Somwehat browned, edges slightly frayed; small tear on fol. 2 from opening; small traces of mounting. Komponist (1809-1847). Clipped section with autogr. signature. O. O. u. D. 1 S. 32:95 mm. Somewhat browned, and some damage to the right corner at bottom. Komponist (1809-1847). 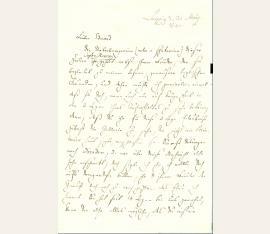 Letter signed ("F MB"). Berlin. 4 SS. auf Doppelblatt. 4to. Via Carl Klingemann to the German Orientalist Friedrich Rosen (1805-1837) in London, sharing his observations on the cold and malicious nature of the Berliners. The composer laments about the way the denizens seem to make it a point to treat the artists poorly during performances: "On the Festival you already know the details from Klingemann; it has become one of our dearest recollections, and I think it is my best composition. A few weeks later the surgeon declared my knee to be completely cured, and I thought I would be leaving shortly, but then the bitter cold came and I postponed the journey and began a large work (a symphony for orchestra, on which I worked a lot every day; it isn't quite finished, but I hope I can finish it before my departure, as I have already begun the last movement. My illness surprised me a few days before my departure, I had already taken my leave and had started to pack; now I'll have to postpone that at least a fortnight longer, but then I think I can leave; my plan is to go from here via Weimar to Munich, then through the Tyrol to Vienna; from Vienna I intend to go to Venice and Upper Italy in the middle or toward the end of summer, and then I think I'll spend next winter in Rome and Naples, then in the spring, if it is permitted to spend so much time on a plan, go to Paris and then to London from time to time, where there may be much smoke and fog and great crowds and poverty, but where pretty nice people live, too, and where I wasn't so bad off for a year. But will I find the same people there then? On this, as on your whole Let (that is Sanscrit for the future) I ask you to let [me] know a lot, also about everything which is dear and precious to me in London, and about our friends at some length. For you have a sharp eye, professor, and when you are sitting on the blue sofa, or silently making tea, or modestly gliding to and fro in the halls of the university with a light red [folder] and a long black robe, you will still make your accurate remarks and comments, and I expect more from you than from many a Berlin lady. What I have to tell you about Berlin, at last, is little and not pleasant, the people are cold, malicious, and make it a point of honor never to be content; even when [Henriette] Sonntag performed recently she was received quite coldly and was palpably slighted in favor of the others in the cast; her sister, who performed the next evening, was almost completely hissed from the stage, for which the other faction took revenge, and in their first scene (in Othello), all the participants were hissed at and Mme. Sonntag had a curtain call, and at that they speak, think, and do nothing differently than Mme. Sonntag and the factions for and against her. But is such formation of factions something a reasonable and interested public should do and doesn't it spoil any enjoyment of the work of art and all joy of the artist? But that's how they are in big and little things, and the Flower Market that opened yesterday in the University Gardens, for which a single gardener has obtained a monopoly, is just as good a proof of it as the dearth of operas other than by Spontini and Auber for which the Royal Theater has in turn obtained a monopoly, and like the monotony of the parties and conversations here; God will improve this when He has nothing to do but that, but I'm afraid He'll get other things and so much to reform that the Berliners' turn won't come for a long time, so for now they are good enough. Let me know what the Johnstons are doing, whether Ritter is still the same as back then, and whether Mühlenfels has been successfully introduced to society and speaks French with Federita. Let me know, too, about the stone monkeys, the wooden chairs from King Edmund the Cannibal's time, and the scraped-off portraits. My chests from England arrived a few days ago and filled me with longing again. Have you been back to Atwood's again since then, and did you entertain the fellow with some Ikojan Atchi? You see how I have learned from you. In short, write me about each and every thing, but especially, write me [...]" (transl.). - Friedrich Rosen became Professor of Sanscrit at the University of London (later University College) in 1827, at the age of twenty-two. 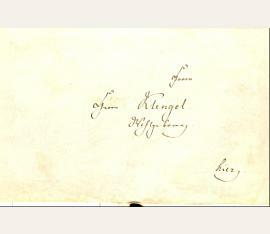 Carl Klingemann was Mendelssohn's close friend and collaborator who wrote the words for many of the composer's songs. Karl Wilhelm Ludwig Heyse had been Mendelssohn's tutor until 1827. The Festival is possibly the Grosse Festmusik zum Dareifest (Grand Festive Music for the Durer Celebration) of 1828. The Symphony may be the Fingal's Cave Overture written in 1830. One of the Liechtenstein songs is doubtless Frühlingslied (Song of Spring), op. 19, no. 1..
Komponist (1809-1847). Autograph letter signed. Leipzig. 4 SS. auf Doppelblatt. 4to. To the Committee for this year's Lower Rhenish Music Festival in Dusseldorf. 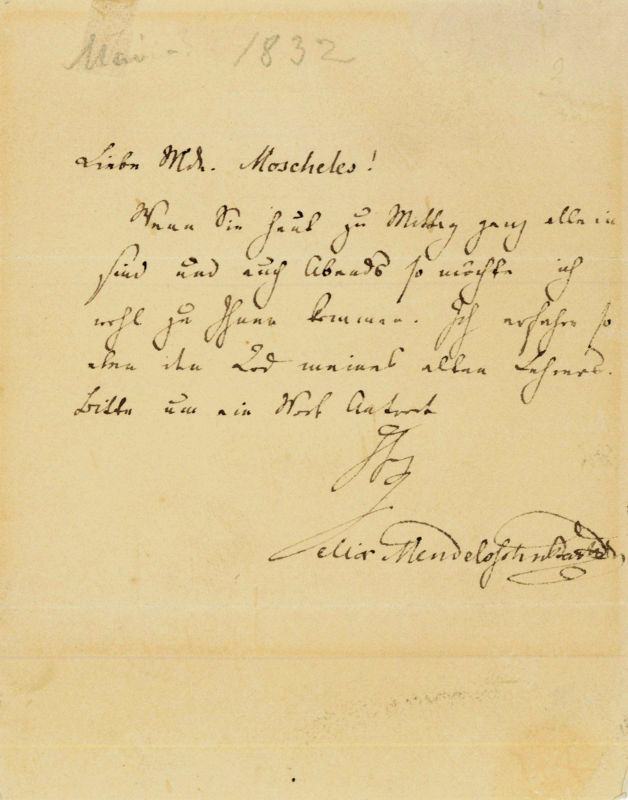 Mendelssohn, the 1839 Director of the Lower Rhenish Music Festival, writes to the festival's committee recommending the works to be included. "I hasten to answer, as the time is indeed approaching and is beginning to press. Against the march and chorus from the Ruins of Athens, which you are adding to the second day, it is only natural that I have nothing to object; I would suggest putting the piece right after the Eroica Symphony, where it would certainly have a good effect. But I wouldn't know what cantata by Bach to suggest for the second day as now programmed; I don't know any which would fit in as regards the time it needs and even more as regards style; if another piece needs to be selected, I would perhaps suggest the chorus by Haydn 'Des Staubes eitle Sorgen' but it seems enough to me, anyway. In 1833 with you and 1834 in Aachen, the program of the 2nd day was shorter than this; last year in Cologne it was at least no longer, and so I think: 1) Eroica Symph[ony], march and chorus by Beeth[oven], new hymn by Spohr. 2) Overture and Psalm -would be quite a sufficient program. To be sure, if Herr Rietz doesn't keep his promise, quite a substantial overture would have to be selected, to make the second part as interesting as possible. But this time the main thing for me would be if you could manage to have Alceste performed in the theater. You write of the difficulties with the chorus; they are indeed the biggest ones that can place themselves in its way, to my knowledge, but even if they couldn't be removed, I would prefer seeing Alceste performed with a very bad chorus a hundred times more than giving up the idea completely. First, in Alceste the main thing is Alceste herself, then Admet, then Hercules, and then only the chorus, and with a performance to be expected from Frl. von Fassmann and Tichatschek or Eichberger or some other outstanding Admet, the chorus recedes in any case into the background. Then there is the second question if it is impossible to improve the chorus? Couldn't 12-20 of the best chorus singers be brought in from Cologne and Aachen? I would with pleasure come a week earlier myself for this and hold separate rehearsals for the chorus every day to make this performance possible. Finally, several passages could and in such a case would have to be deleted, such as the ball in the second act and similar passages in which the chorus plays too much of a main part, and as I said, that would be that much more feasible as Alceste herself and her and Admet's suffering are definitely the main thing in the opera. As several of your members know, I already felt the urgent wish for something new in the course and sequence of the music festival last year, and I said so. My suggestions on this were perhaps not practical, but now, through this coincidence, the opportunity arises this time in Dusseldorf, at least, of giving the festival a new attraction of the kind I had in mind. If this music festival performs the Messiah on the first day, then the Beethoven symphony with a miscellaneous program, and finally a Gluck opera (and even if it is most inferior in execution and even if it has the worst chorus, but beautifully sung in the main roles and beautifully played by the orchestra), this would indeed be something new, as I wished, and because of that this music festival would be outstanding as compared to all the earlier ones. I would therefore very much wish that this plan, even if it be only the hope of it, be mentioned already in your first tentative announcements - how differently would the music festival appear because of it! In the interest of the public, too; in regard to the box office it would also make a palpable difference. Of course I assume that the performance would have to be considered in conjunction with both the others, and only those would receive tickets to the opera who had attended the music festival on the preceding days or had been participants in it. And even if the prices were not raised, the proceeds would be significant. Not to mention the enjoyment all friends of music would derive from it. I ask you to let me know your answer as soon as possible, as I would, as I said, to this end make my departure earlier, if necessary. In any case your speedy answer is now very much desired, as the time is now fast approaching [...]" (transl.). - In a postscript, Mendelssohn has written: "The fine tenor here, Schmidt, just came to ask if he couldn't take part in the music festival; he would try to arrange things so that he could come there at that time and take a solo pan. I told him you had written Tichatschek, but he claims that he is giving guest performances in Berlin at Pentecost and would thus not be able to come to the Rhine. Also, the things that Schmoetzer and Eichberger, whom I mentioned to him, are also detained. So I don't hesitate to let you know about his wish. 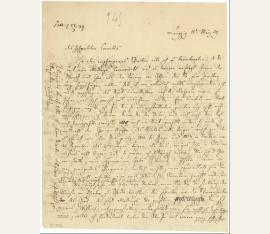 In a second postscript written in the left margin of the first page Mendelssohn has added; Please have the kindness to hand the enclosed letter over to Director Schadow" (transl.). - The Lower Rhenish Music Festival (Das Niederrheinische Musikfest) was one of the most important festivals of classical music, which happened every year with few exceptions between 1818 and 1958 at Pentecost for 112 times. The Festival was held in various German cities over time and the directors included Robert Schuman, Richard Strauss, Franz Liszt, Otto Goldschmidt, Anton Rubinstein, Hans Richter & Richard Strauss. - Light browning; small clipped section on f. 2..
Komponist (1809-1847). 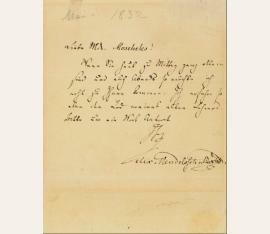 Autograph letter signed ("Felix"). Leipzig. Groß 4to. 2 SS. To an undisclosed recipient: "When I posted the letter to you the day before yesterday, I already half suspected that yours would come yesterday - and it really did, and scolded me, and I deserved it, too. But write me again soon and tell me how you are. 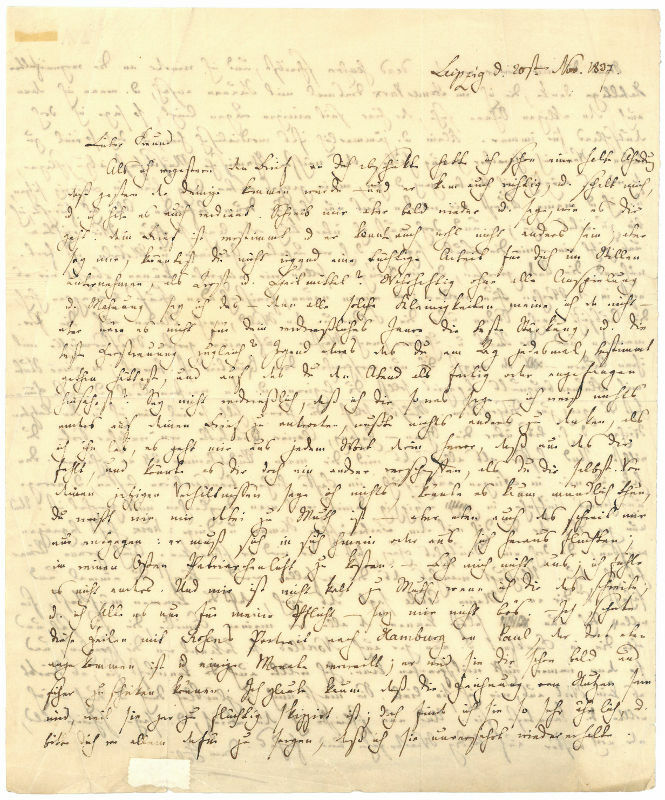 Your letter is in a bad mood, and it couldn't very well be otherwise; but tell me, couldn't you undertake some good and proper project of your own, in seclusion, as a comfort and therapeutic? [...] I am sending this letter with Rosen's portrait to Paul in Hamburg, who has just arrived there and will be staying there a few months; he will certainly be able to send it to you soon. I hardly think the sketch will be of any use because it was done so very hastily; but I find the likeness so very good, and I ask particularly to see to it that I get it back undamaged. When you write of the dead season again, and I think again of the despairing foggy days I was amazed to see this time in James Park, and when I then also see the disgusting snow that has been lying here for several days, then I say Germany forever, after all. Small and miserably dead it is here, and yet there is much to live for. If I had enough character to turn down the next Rhinish Music Festival, it could be possible that I would stay entirely, my whole life, sitting here in Leipzig, and I and my art, we would be only the better for it. But I fear I am too vain for them; and yet I must do it sooner or later. We are furnishing our flat - as people say - i.e., there has been constant talk of wallpaper, curtains, and furniture, and in a week we are supposed to be able to move in, although we don't want to until 4 weeks from now; in a new house standing alone, on the third floor, the view to the South over the fields and the forest, to the North on the promenade and the city and towers, to the West on a big water mill with its wheels, then you only have to drop in, your quarters are ready; in a room papered with bouquets of flowers you are to have lodgings, and the white hall and our rooms are completely at your disposal. You shall hear music, half as much as I in the last weeks, i.e., up to your ears - singing, piano, quartets, of whatever kind you want. And better than all that you will find my Rüdesheimer 1834 wine. I picked it out in Bingen, had a cask of it transported here, and am creating a huge furor with it here in Leipzig because they aren't used to things like that. And now even you, who has had to make do with the barbaric [...] things: Hock [Hochheimer is a wine from the Main area], and still have a German heart - you will like it [...]" (transl. from the German original). - Mendelssohn paraphrases the quote from the opening poem of Goethe's collection of poetry, The West Eastern Divan: "North and West and South splinter, thrones burst, kingdoms tremble; fee to taste the air of patriarchs in the pure East". Rosen, to whom he refers, is the Sanskrit scholar Friedrich Rosen, who had died in London on September 12, 1837. Cecile Jeanrenaud is Mendelssohn's wife, who he had married on March 28, 1837. - Crude repair to marginal tears..
Komponist (1809-1847). 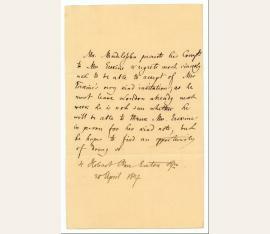 Autograph letter signed (within the text). "4 Hobart Place Eaton Sqa. ", i. e. London. 1 S. auf Doppelblatt. 8vo. To Mrs. Erskine, possibly the wife of the Scottish orientalist and historian William Erskine: "Mr. Mendelssohn presents his Compts. 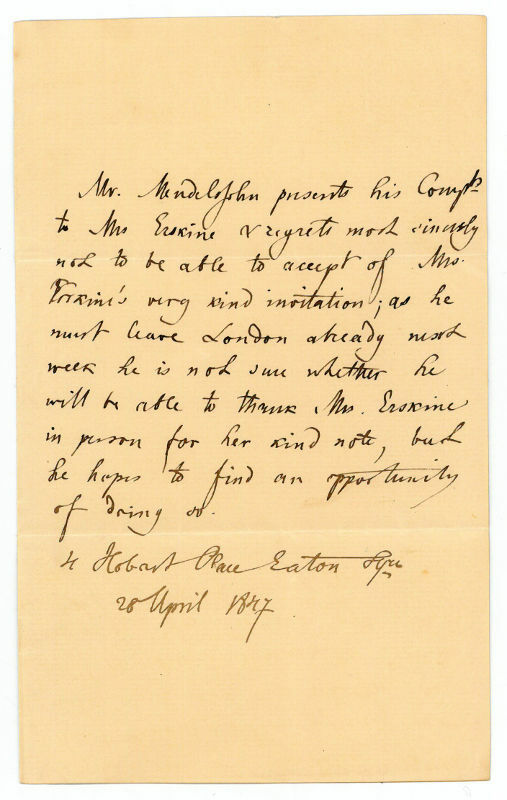 to Mrs. Erskine & regrets most sincerely not to be able to accept of Mrs. Erskine's very kind invitation; as he must leave London already next week he is not sure whether he will be able to thank Mrs. Erskine in person for her kind note, but he hopes to find an opportunity of doing so [...]". - Mendelssohn was known to have been in London in April 1847, to hear Jenny Lind sing in Meyerbeer's "Robert le Diable". Mendelssohn greatly admired Lind and in the 1840s she became a protégée - it was rumoured that in 1847 he had written to her to suggest an elopement, though she was married at the time. 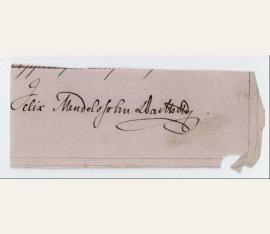 - On laid paper watermarked "J. WHATMAN", with two early horizontal folds, in very good condition. 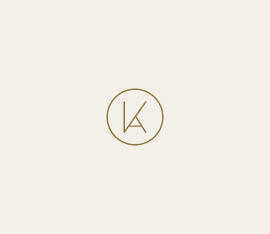 - Though not formally signed, the use of his name at the beginning is effectively a signature..
Komponist (1809-1847). AMusQS. "Donnerstag d. 5ten Januar 1843 in Leipzig Nachmittags". ¾ S. Qu.-gr.-4to. Unter Passepartout gerahmt. 17 bars for piano, "all[egr]o vivace". - Slightly browned and occasional spots; edges trimmed. Traces of mounting on reverse. Felix Mendelssohn-Bartholdy (1809–1847), German composer. ALS (“Felix”). Leipzig, 25 Feb. 1840. 8°. 2 ¾ pp. on double leaf. With autogr. address. In German. 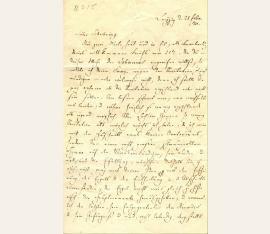 Fine letter to his childhood friend Julius Schubring (1806–89), regarding festival music for Leipzig – probably the “Festgesang” for Johannes Gutenberg for the Printers’ Festival in June. Mendelssohn-Bartholdy describes his ideas for the composition very vividly and in great detail, also relating to ideas Schubring had advanced in an earlier letter. He tells his friend to completely disregard the festival’s organizers: he had only promised them a new composition, but not necessarily anything tailored to the occasion. If necessary, he has plenty of other new compositions ready. 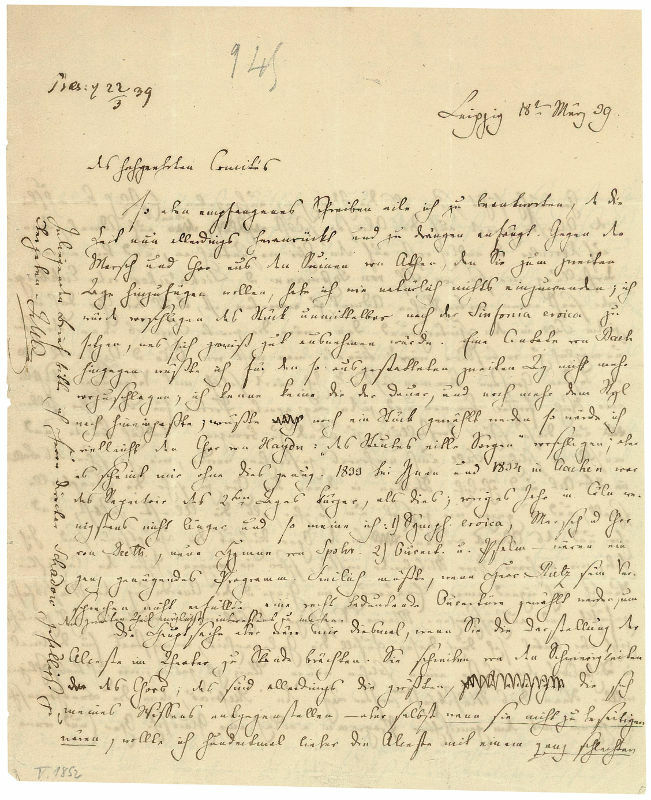 Mendelssohn proceeds to enquire about the apocryph gospel of Nicodemus and his descent into hell which Schubring had mentioned, and intends to base his great composition on heaven and hell upon it. He enquires about the main outline of this gospel and where he might get hold of a synopsis, as he does not suppose a translation is available and would much prefer not to have to read it in Greek. – Printed (with variations) in: Julius Schubring (ed. ), Briefwechsel zwischen Felix Mendelssohn Bartholdy und Julius Schubring. Zugleich ein Beitrag zur Geschichte und Theorie des Oratoriums. Leipzig, Duncker & Humblot, 1892. – Slight defect to fol. 2. due to opened seal (seal perfectly preserved; no loss to text). Felix Mendelssohn Bartholdy (1809–1847), composer. ALS. Leipzig, 11 July 1846. 1 p. on double leaf. Large 4°. With autogr. address and well-preserved seal. – In German. To the city councillor J. Seydlitz in Cologne: “Today I approach you with a musico-diplomatic request. Mrs. Hermentag (I hope I am not misspelling the name) has repeatedly desired me to procure a permanent position as a concert singer for Miss Schloss, either here or elsewhere. Now, counter to my expectations, I just have heard of such a position, and it is possible that the same might be given to Miss Schloss, but before I could do anything in this matter I would have to know whether she will be available next winter and whether she is inclined to accept such a position in Germany, on German (not English) terms. This question, however, I hesitate to pose to Miss Schloss directly, and I also do not wish to trouble you with it, but as you see Mrs. Hermentag so frequently and she seemed to close to Miss Schloss, this way seemed the easiest to me to find out, and so I ask this of you [...]”. 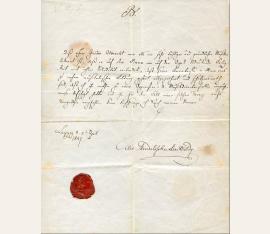 – The recipient of this letter was the son-in-law of the jurist Erich Heinrich Verkenius (1776–1841). Mendelssohn Bartholdy visited him on August 15 during his journey to Birmingham, where his oratory “Elias” was to enjoy its first performance on August 26. 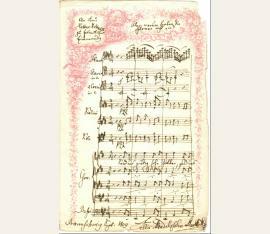 – The Cologne contralto Sophie Schloss (1822–1903) had known Mendelssohn Bartholdy since 1836. She had sung at the Lower Rhine Music Festival in Düsseldorf in 1839 under Mendelssohn Bartholdy’s direction; later she frequently participated in concerts at the Leipzig Gewandhaus and sung in several first performances of Mendelssohn Bartholdy’s works (including the definitive version of the “First Walpurgis Night”, op. 60, 1843). – With small registration mark in blue pencil at top left corner of the first page. Felix Mendelssohn Bartholdy (1809–1847), Komponist. E. Brief mit U. Leipzig, 30. März 1841. 1¼ SS. Gr.-8°. Mit e. Adresse (Faltbrief). – An den mit ihm befreundeten Maler Eduard Bendemann: „Die Ueberbringerinn (oder -schickerin) dieser Zeilen Sophy Horsley gehört nebst ihrem Bruder, der sie begleitet[,] zu meinen besten, genauesten Englischen Freunden, und daher möchte ich zweierlei: einmal daß sie Dich, wenn auch nur auf kurze Zeit in den 3 Tagen ihres Aufenthaltes zu sehen bekäme; dann, daß Du ihr für diese 3 Tage Erlaubniß gebest die Gallerie zu sehn [...] Sie hat 14 Tagen bei uns gewohnt, kann Dir also alles mögliche, das Du wissen willst, von uns erzählen [...]“. – Sophy Horsley war die Tochter des mit Mendelssohn-Bartholdy seit 1829 eng befreundeten Komponisten William Horsley (1774–1858) – Eduard Bendemann (1811–1889) „galt als große Hoffnung der Düsseldorfer Schule und wurde 1836/37 mit Julius Hübner als Professor und 1838 als Leiter eines Malerateliers an die Dresdener Akademie berufen. In dieser Zeit malte [er] die Wandgemälde des Schlosses (1839–55) und seine besten Portraits“ (DBE). Nach Wilhelm von Schadows Rücktritt vom Amt des Direktors der Düsseldorfer Akademie 1859 übernahm Bendemann deren Leitung, „bis er 1867 u. a. aus gesundheitlichen Gründen resignierte. Sein Haus war Anziehungspunkt bedeutender Persönlichkeiten, unter ihnen Clara Schumann“ (ebd.). Felix Mendelssohn Bartholdy (1809–1847), Komponist. E. Brief mit U. Leipzig, 16. September 1839. 2½ SS. auf Doppelblatt. Gr.-8°. Mit e. Adresse (Faltbrief). 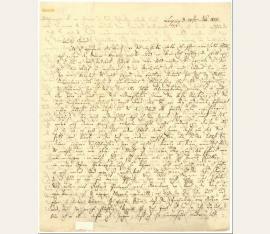 – Nach seiner Rückkehr nach Leipzig an den Getreide- und Hopfenhändler Dietrich Wilhelm Krause (1773–1845) mit Dank für den so überaus gastfreundlichen Aufenthalt bei Krause in Braunschweig: „[...] Es geht mir mit dem Schreiben von dem was ich so recht herzlich meine fast wie mit dem Sprechen – es will mir nicht so wie ich’s fühle aus der Feder, so wenig wie aus dem Munde [...] Unsere musikalische Saison fängt nun nach Gerade an, einige Virtuosen lassen sich schon sehen u. bald auch hören, man verspricht uns eine sehr gute Concertsängerinn [!] aus Brüssel, und ich hoffe Sie würden einen Ausflug hieher nicht zu bereuen haben, wenn wir es Ihnen auch nicht in dem Maaße schön bieten könnten, wie Sie uns bei sich [...] Herrn u. Frau Hollandt geht es hoffentlich so wohl, wie ich von Herzen wünsche [...]“. 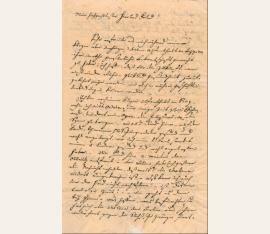 – Krause war der Besitzer der in frühklassizistischem Still errichteten Villa Salve Hospes in Braunschweig, wo Mendelssohn Bartholdy logiert haben dürfte; nach Krauses Tod erbte seine Adoptivtochter Helene Sand (1816–1866), die mit dem holländischen Offizier Hermann Hollandt verheiratet war, das Anwesen, das im 19. 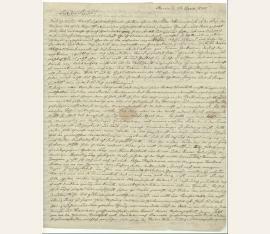 Jahrhundert zum Mittelpunkt des kulturellen und gesellschaftlichen Lebens in Braunschweigs zählte und wo u. a. Caroline Schlegel, Friedrich Schelling und Hans Christian Andersen verkehrten. – Das Respektblatt mit kleinem Ausschnitt durch Öffnen der Verschlußmarke und kleinen Notizen von fremder Hand zum Verfasser; leicht knittrig. – Unveröffentlicht. 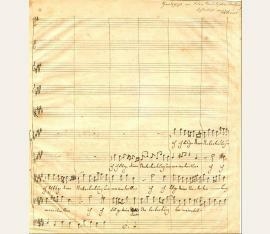 Three bars of singing scores from Mendelssohn’s oratory “Paulus” (op. 36), the beginning of the chorus, “Show us clemency, great Gods”. With dedication “to Mrs. Helene Hollandt in kind memory.” – “But why do the horns not start?” – In August and September of 1839, Mendelssohn Bartholdy had spent several days as a guest at the Braunschweig villa Salve Hospes, which Helene Hollandt’s (1816–1866) adoptive father, the grain and hops merchant Dietrich Wilhelm Krause (1773–1845), had built in the early 19th century and which had become a center of Braunschweig’s cultural life and society, a place frequented by Caroline Schlegel, Friedrich Schelling, and Hans Christian Andersen. – Decorative lithographed border. Noticeable edge defects; slight paper loss in upper right corner (no loss to text). Somewhat dusty. „Canone a 2“. Eigenh. musikalisches Albumblatt mit Widmung und U.
Mendelssohn pens 14 bars of music on two staves, identifying it above as “Canone a 2,” with the place and date below, “Leipzig 28th Marz, 1841.” In fine condition, with light overall toning (heavier to edges), a few tears repaired with tape to reverse, and a few other small edge chips and tears (none affecting the music or signature). Pencil notation to reverse describes it as an unpublished canon in E-flat minor (misidentified, as this is in C minor). 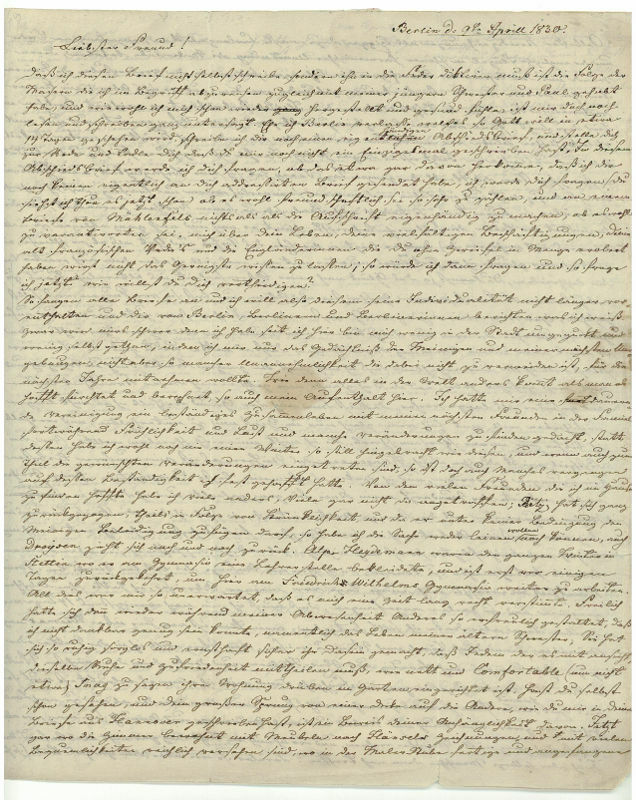 This is most likely a later transcript of the original canons composed in 1837–38. The earliest known example, dated February 1839, is now preserved in the Bibliotheque National in Paris. Felix Mendelssohn-Bartholdy (1809–1847), Komponist. E. Brief mit U. Leipzig, 2. April 1847. ¾ S. auf Doppelblatt. Gr.-4°. Mit wohlerhaltenem rotem Lacksiegel. – Empfehlungsschreiben für einen ehemaligen Schüler, den Organisten und Pianisten Gustav Albrecht (1825–1901): „Daß Herr Gustav Albrecht mir als ein sehr tüchtiger und gründlicher Musiker bekannt ist, daß er auf dem Piano wie auf der Orgel bedeutende Fertigkeit mit ächter [!] Solidität verbindet, daß seine Kenntnisse in allem was zu wahrer musikalischer Bildung gehört ausgezeichnet und schätzenswerth sind, daß ich ihn mithin zu einer Organisten- od. Musikdirectorstelle vorzugsweise befähigt halte und ihn für den Fall einer solchen Vacanz aufs dringendste empfehlen kann bescheinige ich durch meinen Namen | Felix Mendelssohn Bartholdy“. – Mit kleinen Randläsuren und einem winzigen Papierdurchbruch inmitten; gering fleckig und mit leichtem Abklatsch des Siegels. Eigenh. Brief mit U. „Felix MB“. 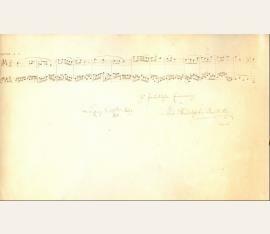 To musical director F. A. Succo (1801-1879) concerning an organ. 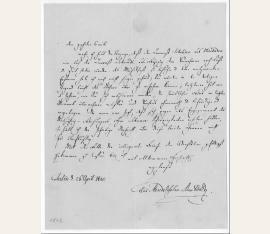 Mendelssohn Bartholdy is not quite sure at the moment whether he wants to acquire it or not, and asks Succo not to undertake any efforts in any direction. Felix Mendelssohn Bartholdy (1809-1847), Komponist. Fragment eines e. beschriftetes Kuverts (Vorderseite), o. O. u. D., 1 Seite quer-kl.-8°. „Herrn | Herrn Klengel. | Wohlgeboren. | hier“. – Die Rückseite abgetrennt u. hier nicht vorliegend. Allerdings mit nur am Rand leicht gebrochenen schwarzen Lacksiegel „FMB“. – Der Empfänger ist Julius Klengel, Lehrer am Leipziger Conservatorium. Choir sketch. Score for the words “I am he that blotteth out thy transgressions for mine own sake” (Isaiah 43:25). Eleven bars, ten staves (only the bottom four or five having been executed). Certificate of authenticity, signed by the composer’s brother-in-law Wilhelm Hensel, at the upper edge. Eigenh. Brief mit U. ("Felix Mendelssohn Bartholdy"). To Mr. Schramm, president of the committee for the 24th Lower Rhenish Music Festival, recommending tenors Carl Schrader and Heinrich Schmidt and mentioning the singer Adolph Schunck: "Dem geehrten Comité mache ich heut die Anzeige, daß der Tenorist [Carl] Schrader aus Wiesbaden wie auch der Tenorist [Heinrich] Schmidt aus Leipzig dem Vernehmen nach Lust u. Zeit haben würden, das Musikfest zu besuchen u. daher mitzuwirken. Ersteren habe ich noch nicht singen gehört; Sie würden in der dortigen Gegend leicht das Nähere über ihn erfahren können; letzerer hat vor 3 Jahren, wie Sie sich entsinnen werden, die sämmtlichen Blo's [?] im letzten Moment übernehmen müssen und durchaus ehrenwerth und befriedigend vorgetragen. Da man mir sagt, daß sich gegen das Engagement des diesjährigen Blosängers Hrn. [Adolph] Schunck Schwierigkeiten erhoben hätten, so hielt ich die sofortige Nachricht über diese beide Herren nicht für überflüssig. Mit der Bitte die inliegenden Briefe den Adressaten gefälligst zukommen zu lassen bin ich [...]".